Two more quilts arrived from my machine quilter. This cherry quilt is from the book "Quilting with my Sister" by Barbara Brandeburg and Terri Christopherson (sp.?). I used Pat Sloan fabircs from about 4 yars ago. Not the greatest picture but I found these at Jo-Ann's and with a little handi-tak they are up....now I want more..with sewing/crafting theme....I'll be keeping a look out. A couple more giveaways check them out here and here!! Calamity Jane's Cottage is getting ready for fall with a cool purse giveaway.....Tell them I sent you!!! Well here it is...my new ironing area. 2 cabinets and a topper I covered with batting, ironing fabric and Simplicity by Moda. My Tennessee friend did a dresser in a similar way but with pink floral fabric. Since I have totally copied her enough this week I didn't want to repeat her theme. Aqua/blue and green do mix well with the rest of my home decor. I love it though...it makes me want to iron! Is THAT possible? haha It's been another good week....I was able to get 2 more quilts from my machine quilter. My Smores quilt is back and I love it even more now that it is quilted. Swirls with lime colored thread....it's perfect. This isn't the best picture but I didn't want to leave any of the hearts out. And the detail of the heart meander quilting. Lovely....now to bind them...whew...4 to do now....and 3 more coming. How did I miss these? and a giveaway..
About the giveaway...the lovely Heather and maker of this line is hosting a pattern giveaway. Leave her a comment here! I forgot to show this bracelet that my Tennessee friend made for me. It goes with just about everything. I decided to change ironing table covers. WELL after discussing it with my husband he thought it would be better to make a new 'station'. At this moment it is being built...and this is where we started....a couple of cabinet from Lowe's. Oh I think it's going to be great. 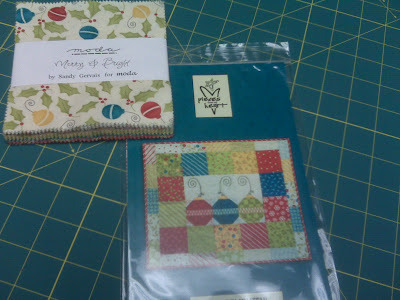 And this is a quilt I'm making using the Jelly Quilts Book and Kaffe Fabrics. I bought the lime in Knoxville and didn't wait but a few days to cut and piece the borders. It's off to the quilter already. My Tennessee friend Carol (no blog)...has been thrifting ALL things pink....and what isn't pink...she spray paints it...well within reason. So I picked up my favorite colors at Wal-mart and they had these glass jars on clearance...and well the rest is history. I can't wait to show the finished results..but here's the start......we'll see....my vacation ended so...with work and all it might be evening before they are done. And a lil' sewing machine decor. She's just getting organized in her new house. I did work on a few other projects like Lynnette Anderson's Noah's Ark BOM and I have 2 of the months stitched but I don't have the borders on yet...that's for a future post. I worked on a Buck a Block BOM and stitched and cut the thangles on 10 of the 12 blocks. I started a quilt from the book Big Blocks Big Quilts...with a April Cornell Portugal layer cake...but it's not done yet....so I won't post it yet...but I was productive. While on my way home from Tennessee I made a pit-stop in Berea. I had read there was a quilt shop so I googled it with my Blackberry and found these shops. The quilt shop wasn't much but they a small amount of fabric and lots of already made quilts. I think the store fronts look cool. While I walked around I spotted the Appalachian Fireside Gallery's window. A display of miniature 1930's style quilts...I was in awe. I LOVE 30's and these quilts were adorable. My favorite was this one below which they just happened to have a poster made with this quilt...so the poster jumped into my hands...but it was only $3. It was such eye candy for me. It made it a worthwhile stop. A short vacation for ME!!!! I visited 7 quilt shops during my mini vacation. I stopped first at the Fabric Shack in Waynesville, Ohio. I spent a bit there...on some civil war fat quarters and a few 1/2 yard pieces. Then Saturday my friend Carol (no blog) and I went to the Knitting Nest..I'll show what I got there in another post. Second we stopped at Mammaw's Thimble in Knoxville, Tennessee. Wow what a shop...the front window is but a taste of the interesting folk you meet inside. Here are my treasures from Mammaw's ....it's quite a mix because they each have a special purpose. There are 9 yards of Kaffe for a backing and border to 2 quilts. A bit of civil war prints....and some older Fig Tree quilt lines for a Kim Diehl quilt I want to make...Oh! and the lime green is for sashing a borders on the Kaffe quilt too...and boy is it ever cool looking. I have already cut the border pieces! Believe it or not 2 of the quilt shops I bought nothing...zip...zero. I swear. I did buy a bit at Loose Threads in Harriman (sp?) Tennessee. That is a wonderful shop. Just my style. We also made it to Crossville due to a slight navigation error that ended with us heading west instead of east. I think it was meant to be. Again I didn't buy much there...2 patterns that's it. We did go to another quilt shop on sunday and I made it to 2 more driving home. All in all it was a dream of a vacation.